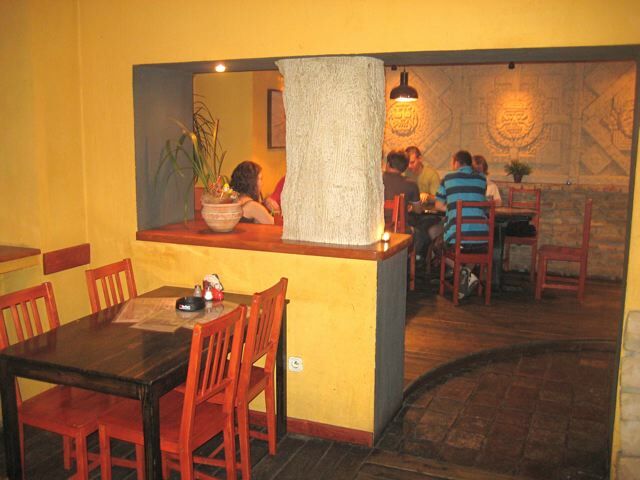 Every week for years, I've been going to the same restaurant/pub in Malá strana to meet a group of friends. 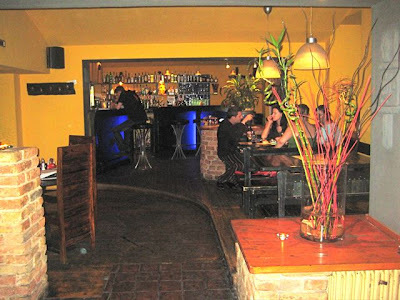 While it is far from perfect, Café Bar Wigwam fills the most of my group's requirements of all the establishments in the area. 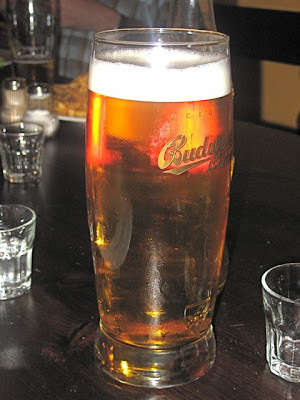 It serves Budvar, which is 32 CZK for a half-liter of 10° and 35 CZK for 12°. This is acceptable and agreeable for those with prohibitions against Staropramen beers. The place also keeps relatively late hours -- it is open until 1 a.m. every night but Sunday. And it has a non-standard pub menu, serving what I call Czech International Interpretative. For a long time, the interior design was devoted to essentially Central and South American Indian culture or perhaps even African, rather than that which relates to the type of Indians who lived in actual wigwams. Quite amusing. 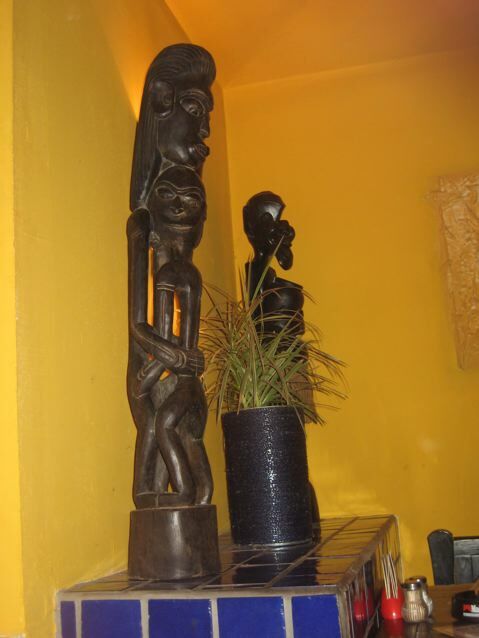 But this changed after a recent interior update that saw the addition of some North American Indian photos, along with heavier chairs and tables. I like the way the place looks. Sometimes every table is taken. Sometimes the place is sparsely populated. I once asked the barman why it was so full on some weeks and not others. "I have no idea," he said. "If you find out, let me know." What is certain is that if the restaurant is full, smoke will get in your eyes. The place is not too well ventilated and the clouds really hang in the air, especially in winter. The eclectic classic rock/disco they always play can get a little tiresome after you've heard it a few times. 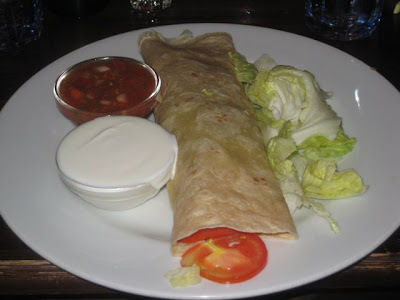 The most ordered meal among all my friends is some variation of the hamburger. 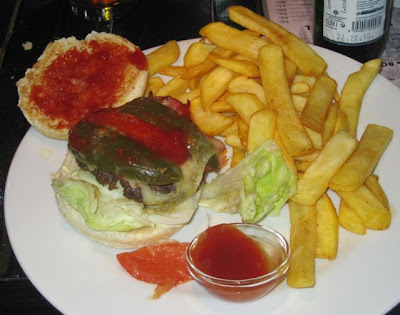 They recently started offering the jalapeno burger, which everyone gets (135 CZK). It comes with steak fries. Now if you read my review of the hamburgers I've eaten in in Prague, you'd know I have a love-hate relationship with this one. Currently, I'm in a hate phase. The meat is always cooked completely through, it is crumbly, it has an odd seasoning I can't quite place, and the bun is small and disintegrates. The fries are large and look good, but they have a somewhat chewy rather than crispy texture. The jalapenos themselves are the best part -- whole sliced peppers across the top. Just keep in mind that all my friends keep ordering it every week and think I'm too hard on the poor burger. Oddly, on a number of weeks, they have run out of them. 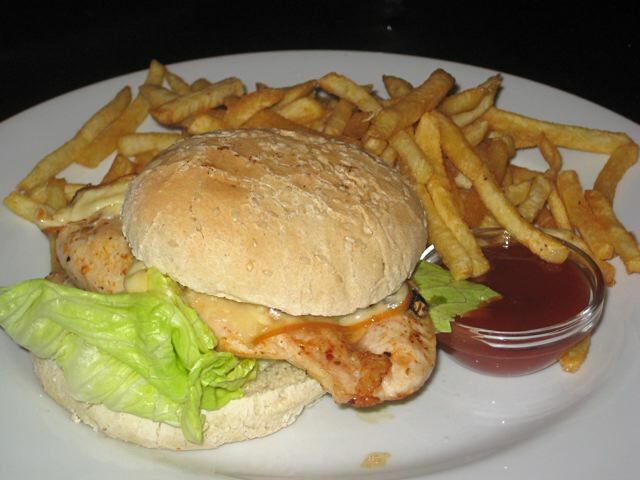 They also do a chicken burger, which is just OK (125 CZK). But I suggest you avoid the pork neck burger (125 CZK). It comes with Niva cheese and Dijon dressing, a combination I find quite awful. So, I've been trying a number of other dishes. Recently, I had the pork ribs (125 CZK). These were fairly tired and dried out, but not past the point of acceptability. There was a sweet, tangy sauce, and it came with a baguette. 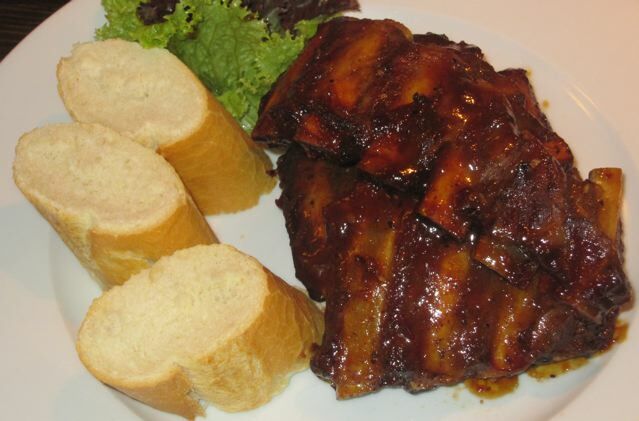 I'd rank them pretty low on my Prague rib scale. That said, I'd probably get them again over the burger. 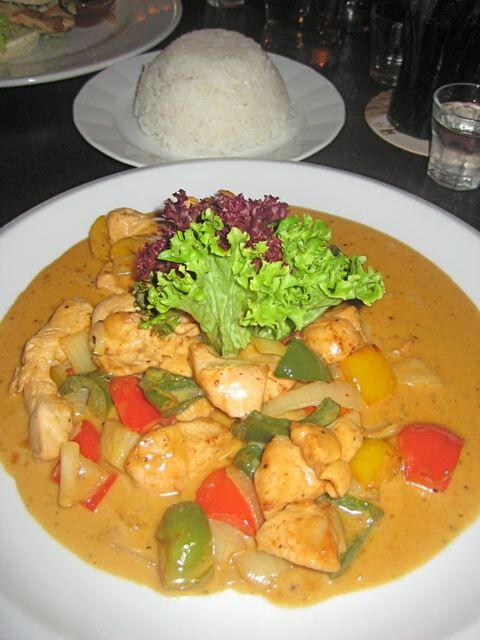 One of the favorites among my group is the Mat Saman Curry (145 CZK). This is an approximation of red curry chicken. It's nothing like an authentic recipe, but it is one of the best things they do. The coconut milk sauce is very thick and on the sweet side. Green and red peppers are mixed in along with onions. The portion is large and comes with a big plate of rice. Curiosity got the better of me and I ordered a recent addition to the menu, the chicken yakitori (145 CZK). I could see no evidence it was grilled over a fire. 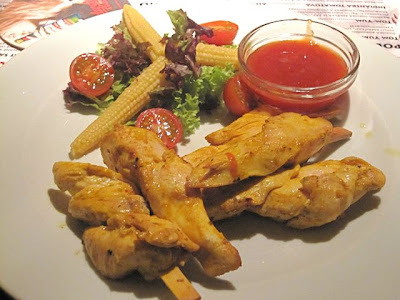 It was much more like a Czech version of Chicken Satay, served on popsicle sticks. The tender meat tasted of coconut and fresh ginger. The sauce was basically Thai chili sauce mixed with ketchup. So, yeah, it's not real ethnic cuisine, but then again, I prefer it over typical Czech pub grub. Once a week, anyway. One of the biggest losers on the menu is the fried chicken in a tortilla (130 CZK). I suppose it resembles a KFC Twister, but those are much better. 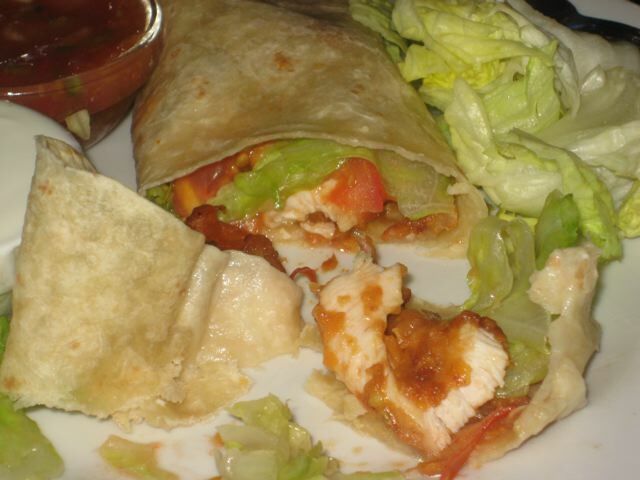 The chicken was overcooked, and all the fried coating fell off and mixed with the iceberg lettuce in the tortilla. It was a mess and did not taste good. The penne with mushroom, olive, chicken, and Parmesan is a better choice (95 CZK). 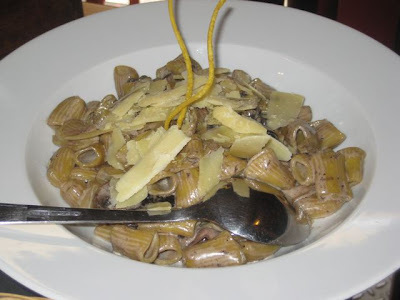 The sauce could be creamier, but it does have a nice mushroom flavor, and they are generous with the shaved Parmesan. To sum up, Wigwam is a decent place to go for a generally young crowd, inconsistent, quirky, occasionally decent food, and quite good prices. The staff is very friendly -- once they get to know you. And they serve my current drink of choice, hruškovice (45 CZK) or pear brandy, in chilled shot glasses. When I'm out with my friends, I don't need much more to live well. Running out of places to review, are we (what is this, the third time)? I will NOT travel across town for it again, but if I'm in the area and not wanting to pay Cafe Savoy prices, I could do worse, I suppose. Come on, let's stick with either new places or previously reviewed places that have since changed significantly (for better or worse). I have to give you credit -- you know your stuff. And my stuff. Your criticism of Wigwam and this post are on the money. That said, there are times when I just can't pull it all together for something new and different. In my weak defense, I was down with the flu for a week and had nothing else in the bag. Part of my reasoning on doing places I've done before is that it is published on Expats.cz and many readers aren't as familiar with my previous visits. However, I know I'm always hungry for something new and different. so I appreciate you keeping me on my toes. I don't consistently read your blog so I hadn't seen this restaurant featured before. I like seeing lots of photos. I do enjoy the home cooking pieces you've written. It's your blog but maybe more of the tracking-down-ingredients and good-places-to-shop-for food-and-wine type thing might pacify the people with a lot of frequent reader miles. I love your blog, especially the many pics! I'll be in Prague for Christmas this year and am wondering if you have any restaurant recommendations for Christmas Eve and Christmas dinners? I'm guessing I'll need to make reservations before arriving. We're looking for somewhere somewhat nice but not over the top. Perhaps around 2000 CZK or less. Perhaps approachable Czech food or somewhere fun/festive you would recommend. We live in NYC, a couple, 30 years old, and are used to neighborhood NYC restaurants. If you'd like to email me, my address is wnf5005 at yahoo com. Wendy: Czechs don't have Christmas Eve and Christmas. "Christmas" for them is only the night of the 24th when they re-gift crap they have received previously from their dear friends. If you don't like carp and/or potato salad (and bon-bons about 5 years past their expiry date), you won't enjoy yourself very much. I recently tried to book at a 5-star hotel for the 24th but was told that roast turkey was too "un-European" for them to cook for me and my 7 guests so I'll be spending the day in Berlin instead. Good luck to you. Hi Brewsta; (slightly less) Cranky Guy again. You say you want new stuff? Okay, a tip for you. "Home Kitchen" at Jungmannova 8. Superb homemade soups, fantastic fresh duck and some pretty exotic sandwiches (though sadly none that interested me in the least). Mind it's just a sandwhich / salad bar and not a full-fledged restaurant. It's not particularly cheap, but very tasty and has great fresh bread. Extremely friendly staff too. Give it a look; ask for Miroslav, the owner. I live right across the street from Wigwam, so at first I was hoping it would become my "neighborhood place." But, after 5 bad experiences, I won't even look in its direction. On three occassions, it took over 30 minutes to get a beer, even when I was the only one in the place. In Prague, where beer flows faster and cheaper than water, that's unacceptable. On my last visit, I got so sick of waiting that I walked back home and pulled one from my own fridge. Let's be honest, the food quality is ok, but the odd combinations of flavors and interpretations on dishes (chicken on popsicle sticks?!) are the kinds of low standards one grows to expect around here. I'm no huge fan of czech food either, but Olympia has great onion rings and solid cooking and it won't take 30 minutes to get a beer. 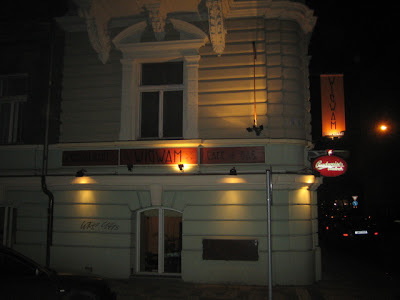 You can easily avoid the overly Czech dishes there as well. 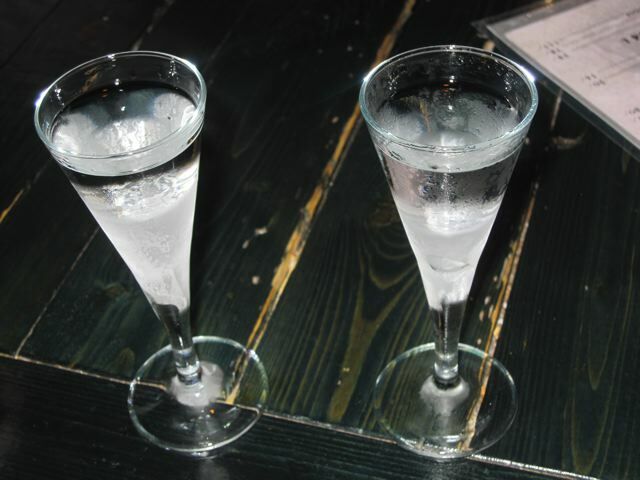 Or, try Savoy, or the new tiny Sardinian place, or even Meduzzy, the Sushi place next to the Seafood Shop or Noi. They're all within a block or two and they're all leagues better than Wigwam.